Recent Islamophobic attacks close to home are prompting Muslim women to learn to protect themselves and their loved ones. A typical class at UMMA Martial Arts. Photo via UMMA’s Facebook page. In community centres, schools and homes over the past week, Muslim women across the GTA coordinated and gathered for self-defence workshops in response to the recent rash of Islamophobic attacks following the terrorist attacks in Paris. 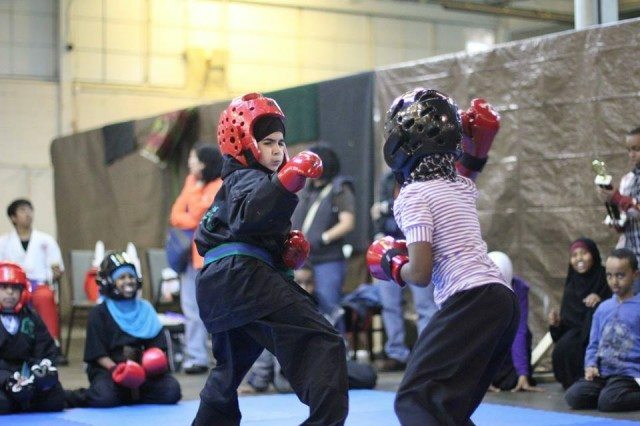 Shireen Ahmed signed herself and her 13-year-old daughter, Rumaysa, up for one of these self-defence workshops last week. While she says this sort of reactionary backlash against identifiable Muslims isn’t new, she was particularly taken aback when a woman was attacked by two men outside her children’s elementary school in Flemingdon Park last month. Ahmed describes her daughter as “super confident” and an athlete, but that doesn’t stop these incidents from weighing heavy on her. The attack in Flemingdon Park was just one in a recent string of potential hate crimes. Two Muslim women were verbally assaulted on the TTC. One woman was assaulted near Bathurst and Bloor when a man mistook the scarf she wrapped herself in for warmth for a hijab. Ryhana Dawood, with a black belt in Karate and Taekwondo, is a regular instructor with UMMA Martial Arts, a Muslim martial arts club with locations in Toronto, Mississauga, Brampton and Oakville. She says it wouldn’t be the first time she has been asked to teach a workshop in reaction to an anti-Muslim incident. With growing demand, Dawood sees the classes she teaches as a way for Muslim women to push back against the fear and anxiety caused by the backlash. Tendisai Cromwell invited Dawood to her home to teach a workshop for a small group of women last week, something she had never done before. However, Cromwell recognized how online campaigns #IllRideWithYou and #BuddyUpTO have shown that people in the city of various religious and cultural backgrounds have stepped up to show support for Muslim women and help them feel safe. Ahmed too was pleased with the outreach of support but said there were other ways allies could show their support. “Now we have a lot of people asking what they can do to show solidarity. If you really want to be an ally then maybe you can sponsor or donate a space because community centre gyms are really expensive,” said Ahmed. Cromwell says it’s the connection that she felt with the other women involved in her class that motivates her to do it again. Ahmed said that she believes these self-defence workshops send a greater message about Muslim women that she has known all along. Cromwell had a similar message.